Forty Rules of Love by Elif Shafak was not one of those books which i would have picked up myself if not for the book club read, but now i am glad to have read this. I thought the title gave up everything about the book but i was wrong, in my opinion I would say it was not Forty rules of love but Forty rules of LIFE! I loved the way how those two parallel stories - Ella’s journey of self discovery and the story of Rumi and Shams of Tabriz was interweaved. 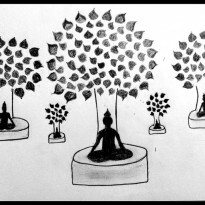 Although at times the pace was becoming slow, these parallel stories kept the whole book interesting. Ella, a homemaker, at the age of forty is fed up of her current monotonous lifestyle. She is not only disturbed by her husbands infidelity but also is unable to cope up with her children, at this time she takes up a job as a reader for a literary agent and starts reading 'Sweet Blasphemy', a novel about Rumi and Shams of Tabriz and the forty rules of love written by Aziz Zahara. As she reads, she gets herself involved with the book and also gets enchanted by the author’s writing and ideology, this curiosity leads her to know more about Aziz so she starts communicating with him and that turns her life upside down. On the whole I couldn’t connect with Ella’s character as i could’t agree with decision she took in he end. That was a bit disappointing for me. 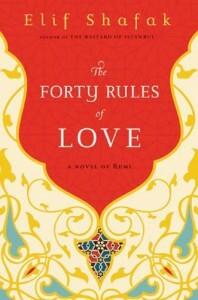 About the other story of Rumi and Shams that was both fascinating and tragic, those Forty rules of love by Shams were just wonderful to read, but very tough to execute, of course. Below are the two rules worth mentioning that i loved.